A collection of parents and caregivers started a series of events in the late 80’s that would, ultimately, lead to the formation of an unheard-of type of movement, one that would uplift the field of mental health to a whole new level. The family movement started with a group of parents dissatisfied over the treatment of their children within many of the child serving systems. For example, only half of their children were in school, and of the half who were not, 75% were in the juvenile justice system. Some parents were forced to give up custody of their children in order to receive services. In 1982, Jane Knitzer, a renowned researched, defined the problem in an issue brief. “Unclaimed Children” turned the spotlight on a group of children and youth with the most serious disorders who were largely ignored and underserved by the mental health system. Her detailed descriptions were so engaging they set the stage for public conversations on these important issues to improve services for families living with mental health problems and psychosocial disabilities, especially in low and middle-income areas where effective services were often scarce. In 1986, Portland State University Research and Training Center on Family Support sponsored the first Families as Allies conference. Bringing together a diverse group of individuals looking to network with each other, this landmark meeting became a catalyst for the family movement. A common connection that bonded them together: all families were going through the same experiences when it came to finding a voice for their children with mental health challenges. This realization led to families networking together at every opportunity they were given as they quickly noticed that a collective voice was stronger than a single one, a collective voice that shared enlightening and thought provoking stories around children who suffered from mental health challenges. Currently, important steps have been made in incorporating family voice at treatment tables and some policy tables; however, funding for family advocacy is still uneven across states. If the movement is to stay relevant, family members must be treated as equal partners of the team and seen as experts on their children. Family Leaders must offer peer support to new families in order to break down the stigma of families being labeled as the problem and not part of the solution. The Family Movement is at a critical crossroad in its evolution. To thrive in the future we must figure out how to pass the lessons learned down to the next generation by developing succession plans for the current leaders while nurturing the next generation of leaders to carry the torch. Reaching out and embracing our millennial parents using modern technology and having families leading the movement is the smartest investment strategy for society and an urgent strategy for the children and families who are coping daily with mental health challenges. In the future, family organizations relationship strategies from years ago may not be effective as policy makers’ focus on reducing costs. Organizations must be able to demonstrate how they are keeping children in their homes and in their communities. Family organizations must begin to bill Medicaid to support their work going forward. Parent stories, when combined with data, can be a powerful tool in making change. Family organizations need to go back to the basics of helping each other through advocacy and support. A balance must be found between grass root advocacies and making sure family voice is present at local, state and national policy tables. Other strategies should include a way to nurture the field and support the people who are doing the work. Our strength lies in the fact that family organizations represent their communities. The director of a mental health services agency shared her agency journey towards cultural and linguistic competence. She said that they had done a lot of work to create a culturally competent agency. They had routine trainings, lunch time chats, policies and procedures to promote cultural and linguistic competence (CLC), available interpreters, and a staff that was a little more racially diverse than when she started there. But it seemed like nothing had changed. There were still disparities in the numbers of families of color who were seeking services, disparities in the completion rates of interventions, disparities in the degree of satisfaction with the services. It was not until after she brought in an “undoing racism” consultant to work with the staff over a period of several weeks, that there was a palpable change in the agency. With the consultant’s assistance, the staff authentically engaged in examining their own attitudes, beliefs, and personal history and engaged in serious reflection and contemplation. They were then able to make use of the infrastructure that had been created for them. The shift in attitude enabled them to engage with families who were culturally different from themselves in a manner that was truly one human being to another. The work to advance cultural and linguistic competence requires both technical and adaptive work. The technical is captured by such elements as: trainings, interpretation and translation, increased diversity of staffing, use of culturally adapted Evidence-Based Treatments, routine demographic data analysis of service area, and community meetings. These are necessary steps, but they are far from sufficient. 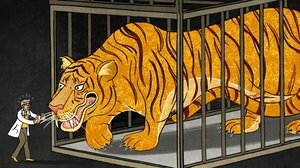 One manifestation of the need for adaptive work is reflected in resistance. This resistance is expected because the topics of prejudice, discrimination, and oppression are controversial and emotionally charged. Examples include the resistance to attend trainings and the resistance to budget for interpretation and translation services. Adaptive work may be indicated in the complaint that qualified persons who reflect diversity cannot be found. Similarly, adaptive work may be indicated by the question, “why should we use an adapted intervention?” or “why should we, the behavioral health experts, include community members in our meetings?” If we explore the reasons for this resistance, we will probably discover that factors such as privilege, conscious and unconscious bias, stereotypes, and power are at play. And yet, disparities in behavioral health services and outcomes persist. The TA Center’s CLC blog series will invite the reader to reflect and engage in a discussion on some of the issues that have served as barriers to authentic change. Readers will be invited to participate in a process to find their way to meaningful, authentic helping or collegial relationships with those who are not like themselves. Concepts such as racism, unconscious bias, privilege, heterosexism, institutional oppression, and internalized oppression will be examined. Readers will be challenged to consider how they personally relate to these concepts, how their colleagues relate to these concepts, and how their organizations relate to these concepts. They will be invited to describe their strategies to address these issues for themselves, with their colleagues and in their organizations. 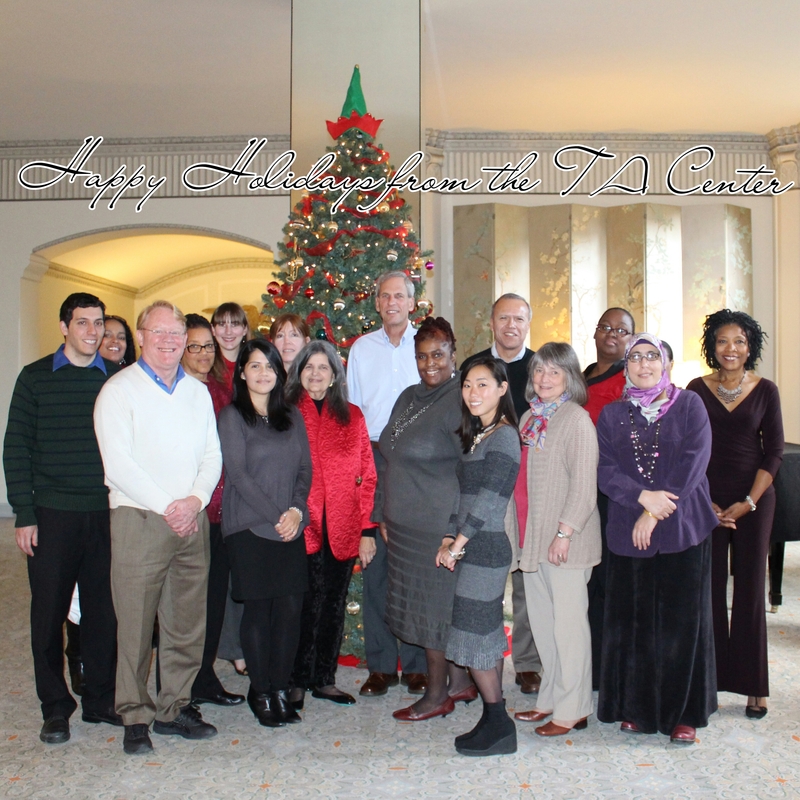 This collective journey is designed to convert the notion of CLC from a once a year training event, to an authentic relationship with a family or colleague, which affirms that we are all cultural beings interacting in a universe constructed of multiple cultures and fraught with institutionalized social injustice. Look for the TA Center CLC series: georgetowntaclc.wordpress.com. Prompts for discussions will be posted the third Thursdays of each month – stay tuned! Please send us your suggestions for issues to explore to Dr. Vivian Jackson or Teresa King. “The world in which you were born is just one model of reality. Other cultures are not failed attempts of being you. They are unique manifestations of the human spirit.” Wade Davis, 2009 The Wayfinders: Why Ancient Wisdom Matters in the Modern World. Who Needs to Pay Attention to the ACE Study? Dr. Robert Block, the former President of the American Academy of Pediatrics, said “adverse childhood experiences are the single greatest unaddressed public health threat facing our nation today.” Many public health issues require a broader response from policy makers, decision makers and even the general population in addition to the helping professionals, to successfully address the issues of concern. 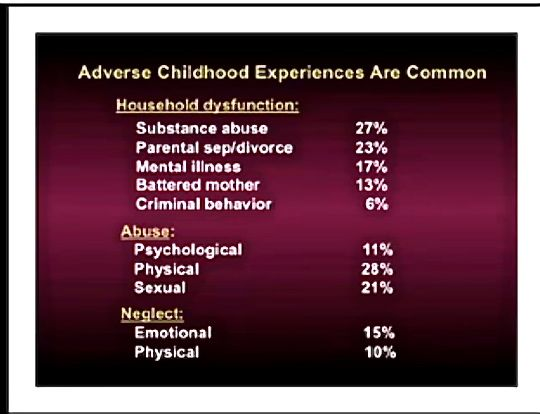 Okay, so some of you may also be thinking that it’s a stretch to put this issue of adverse childhood experiences, i.e. “trauma,” at the top of the list when we have other issues that seem more important. Maybe it’s time to say a little more about the study, what it revealed, and why it is so important for a comprehensive public health approach. Between 1995 and 1997, the Centers for Disease Control and Prevention and Kaiser Permanente’s Health Appraisal Clinic in San Diego conducted the initial phase of the study with over 17,000 adult patients by using a confidential survey during a physical examination visit that contained 10 questions about childhood maltreatment and family situations (before age 18) as well as questions about current health status and behaviors. What the researchers found was that adverse childhood experiences are common – over 2/3 of this group of mostly white, mostly middle and upper class college educated adults with health insurance had an ACE score of at least 1 and 12% had a score of 4 or more. Below is a chart from the original study listing the percentages of individuals who responded yes to the 10 specific questions. More information can be found on the CDC website. As they followed these patients through time they discovered the higher the ACE score, the greater the health risk. The health risks were not only for mental health or substance abuse issues but also for cancer and heart disease and other physical health problems. 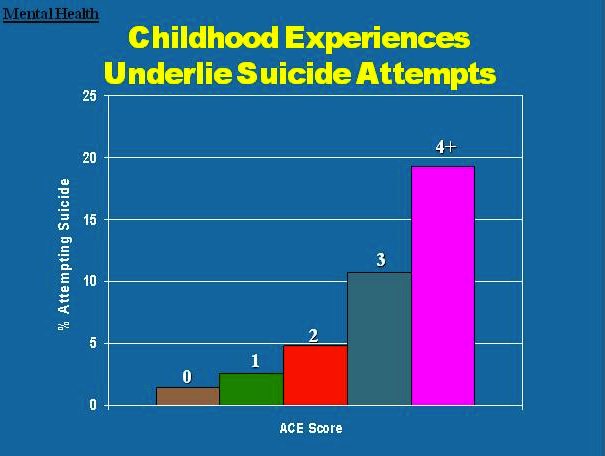 The chart to the right shows clearly how suicide attempts increase as the ACE score gets higher. Individuals with a score of 6 or higher had a 20 year difference in life expectancy from individuals with a score of 0. 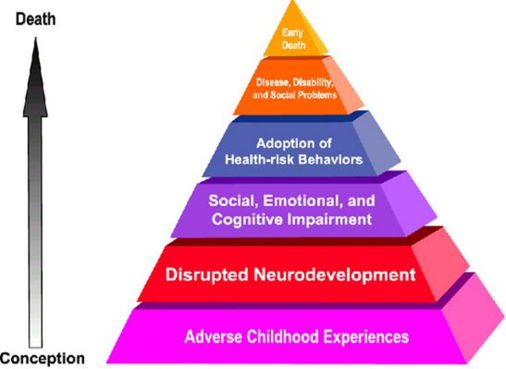 The chart to the left helps to explain the trajectory from early adverse childhood experiences through disrupted brain development that leads to social, emotional and cognitive impairment that can lead to adoption of health risk behaviors, disease, obesity, and social problems and eventually an early death. Dr. Nadine Burke-Harris did a brilliant TED talk getting this message out about the implications of the ACE study to a broader group of people to help change this trajectory by intervening early. The interventions not only include a recommendation for screening in pediatric offices but also educating parents to understand the long term impact of early adverse experiences in an attempt to prevent some preventable trauma. Click the image to watch the video. So, even though you may see this early intervention as something valuable that could help to make life better for those who are now children, you may be wondering about implications for those who are now adults and who have gone through their whole lives without ever addressing or possibly even disclosing their adverse childhood experiences. National Public Radio aired a segment this week about the ACE study and implications for how these 10 questions from the ACE study can be used in a therapeutic way even with adult patients for those physicians who have the courage to ask: 10 Questions Some Doctors Are Afraid To Ask. This segment was part of a larger series called “What Shapes Health” that includes several other segments related to ACE study as well as an opportunity to find your ACE score. Now you may be wondering about cost. If we are going to think about a comprehensive public health approach, won’t that be too expensive? Australia recently released a report showing that as a nation, Australia could save a minimum of $6.8 billion annually by addressing the impacts of unresolved child abuse in adults and a minimum of $9.1 billion annually by addressing the impacts of childhood trauma more broadly. Click here to read details of this report. So now that you’re paying attention, you may want to join folks in exploring how you can get involved in this movement to address adverse childhood experiences as a public health issue by visiting our new trauma tool, “Trauma Informed Care: Perspectives and Resources,” a collaborative project between Georgetown University National Technical Assistance Center for Children’s Mental Health and JBS International. Individuals in over 80 countries have viewed our trauma tool and it’s received over 90,000 hits. Welcome to the first of many blogs from the Georgetown University National Technical Assistance Center for Children’s Mental Health. Dr. Phyllis Magrab established the Georgetown University National Technical Assistance Center for Children’s Mental Health (TA Center) in 1984. The Georgetown University Center for Child and Human Development, which the TA Center falls under, was focused on developing community based services for children of all kinds, and the TA Center was an outlet to expand those services. The TA Center provides technical assistance to ensure that mental health services are family focused, coordinated, and culturally competent. Our goal with sharing our insights in this blog is to continue empowering anyone involved or interested in children’s mental health with information to both inform and help those involved make knowledgeable decisions. We hope you share your feedback because your experiences and views are important to us. You can find toolkits, articles, and other publications our TA Center faculty created on our website. There are also details about upcoming trainings and webinars. Our blog will serve as a place where we can go more in-depth on topics and we will be featuring different faculty members – their work and fun facts. In our first Faculty Highlight, we are featuring the newest faculty member to join us. This fall we welcomed Dr. Linda Henderson-Smith to our TA Center Team as the new Director of Mental Health Planning and Policy. Linda joins us from Georgia where she was the Director of the Office of Children, Young Adults and Families at the Department of Behavioral Health and Developmental Disabilities. Before that she was the Home and Community Based Services Manager at the DC Department of Mental Health. She is featured in the Trauma Tool on the TA Center website, click here to watch. 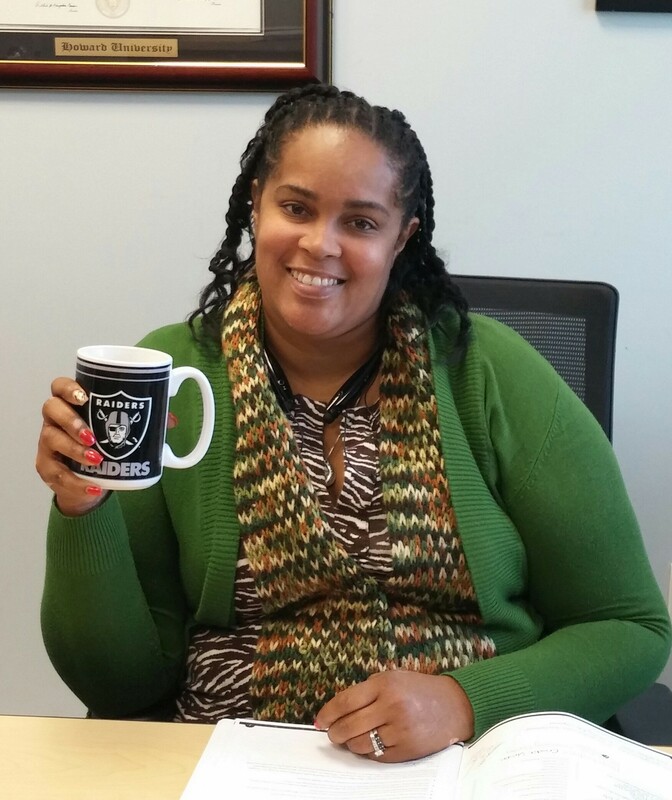 She brings with her, her years of knowledge in mental health at the community and state levels, a great sense of humor, leadership, and lots of Raiders fan memorabilia (she’s a California native). We’re happy to have her on-board! Follow us on Twitter, Facebook, and LinkedIn for up-to-date information about our work and what’s going on in this industry. Don’t forget to join our mailing list to receive our bi-monthly newsletter! We would love to hear your views and feedback in the “comments” section!